Well its done . . . finally. It took me some time but I finished Yarnspirations Mystery KAL/CAL. This was the first Knit-Along that I did. Well my mom and I did it together. I will say that it was fun to work on but its getting warm so it won’t be used until later in the year. The last clue was to add an attached I-cord border to the edge of the blanket. Basically the I-cord is attached by first casting on 3 stitches on a set of double pointed needles. Next pick up a stitch on the edge of the blanket and then slide sts to the end of needle, K2 and then k2tog. Repeat this over and over again to get the I-cord all the way around. Its slow going at first but once you get the hang of it it becomes easy. You’ll want to pick up each bump around the edges so that there is no bunching or stretching. It is easy because all the outside pieces are a garter st so its easy to pick up the sts that are needed. Especially around the corners so it does not curl. I did like the applied I-cord it really flattened out the sides so it looks nice. The only criticism I have is that the video that they provided was not the best because it was just on a random square nothing that had to do with the KAL and it didn’t show how to go around the corner. You can see how the edge looks nice flattened out. Overall the blanket is wonderful. Its warm and cozy and won’t really be used for a while because as I said earlier its getting warm here which is a good thing. I did like doing a KAL/CAL but I don’t know if we’ll do a Mystery one again. 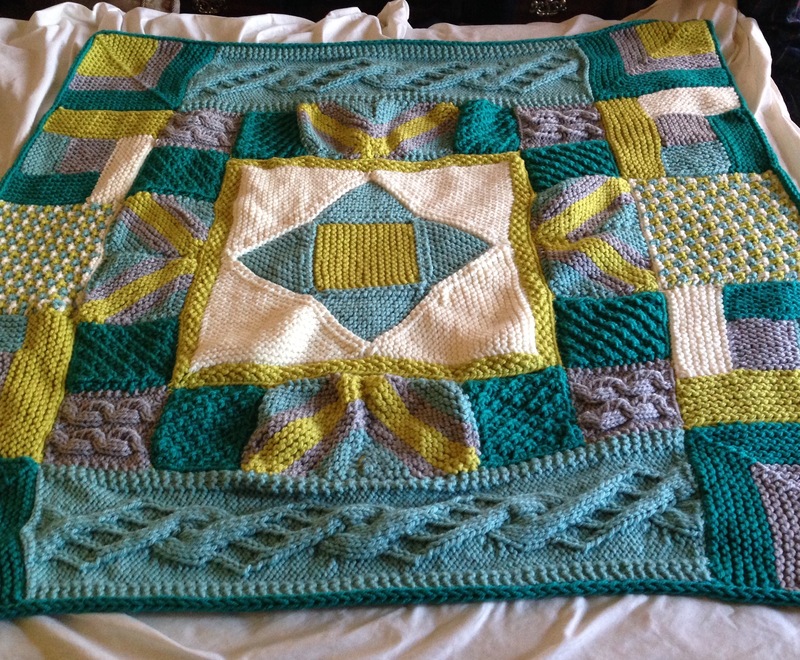 It was nice to have a project that my mom and I did together and did what we were good at a learn new stitches. I am a little upset because I have 10 skeins of yarn left over. Which is too much, they definitely had us buy too much. Its being added to the stash so we’ll find something for it. The Afghan measures 48 in by 48 in. If you did this KAL/CAL let me know how you did and share your pictures. Oh, that’s just lovely. The colours are great. Thank you, I’m glad with how the colors turned out. Is it really necessary to block everything? This is what is keeping me from putting it together. Can’t I just sew it together and then wash and dry the afghan. This is first KAL that I have done. It was fun but now comes the putting together. Many of my projects have come to rest in plastic bags they are waiting and may get together in an after life.